WASHINGTON -- The conservative American Legislative Exchange Council is wading back into election issues, as it considers supporting a bill that would increase the role of state legislatures in the election of U.S. senators, chipping away at the powers vested directly in the people under the 17th Amendment. ALEC circulates model legislation to state legislators, and its bills have resulted in states passing laws related to voter ID, so-called Stand Your Ground issues and the elimination or reduction of state income taxes. In early December, a group of ALEC members are scheduled to consider supporting a range of potential new model legislation, including the "Equal State's Enfranchisement Act," according to a memo posted on the group's website. The bill would significantly increase the role of the state legislature in the election of U.S. senators, inching back toward the process used prior to the passage of the 17th Amendment in 1913. The 17th Amendment established the direct election of U.S. senators. Before this amendment, senators were chosen by state legislators. Under the draft measure, a plurality of the state legislature would be able to nominate a candidate to appear on the ballot, alongside candidates nominated by the parties through the convention or primary process. "It's an attempt to blunt the effects of the 17th Amendment by reinserting the state legislature and their views back into the process of electing U.S. senators," said UC-Davis School of Law Professor Vikram Amar, stressing that it was just his first "gut reaction" to seeing the bill. "By itself, it's not a full-fledged repeal or circumvention of the 17th Amendment ... but it's kind of an encroachment of the vision of the 17th Amendment." The ALEC measure is not coming out of thin air. For years, some Republican politicians have called for the repeal of the 17th Amendment, and that effort has picked up steam with the rise of the tea party movement. Sen. Mike Lee (R-Utah) believes the country "lost something when we adopted" the 17th Amendment. Former Rep. Pete Hoekstra (R-Mich.), who lost his Senate bid in 2012 to Sen. Debbie Stabenow (D-Mich.), said, "The direct election of U.S. senators made the U.S. Senate act and behave like the House of Representatives. The end result has led to an erosion of states' rights." Texas Lt. Gov. David Dewhurst (R), when asked recently whether he backs a repeal, replied, "You betcha, kemo-sabe. Right now many members of Congress, United States senators and United States congressmen don't have a feeling for what the states need." A return to election issues has been tricky for ALEC, after it received significant backlash for its earlier advocacy for voter ID laws. Last year, ALEC said it was dropping its Public Safety and Elections task force to "concentrate on initiatives that spur competitiveness and innovation and put more Americans back to work." The Equal State's Enfranchisement Act is being considered by the group's International Relations task force and Federal Relations (Federalism) working group. George Mason University Associate Professor of Law David Schleicher argues that repealing the 17th Amendment may not have the effect that advocates believe. "People who support 17th Amendment repeal or anything like it misunderstand what the 17th Amendment did and why it passed. ... [It] was the desire to allow state elections to be about state issues and not to be about national issues," he said. In other words, important state policy issues like transportation and jobs could get pushed aside because voters would focus instead on choosing state legislators who support their preferred candidate for the U.S. Senate. "If people were voting in a legislative election and the state legislature would choose the senator, the senator would be the only important [issue]," said Schleicher. "People would just vote for the senator." Amar believes that such legislation could also prove unconstitutional. State legislatures are allowed to regulate the procedures by which elections are held, but they are not supposed to be involved more substantively, which, he argues, the draft ALEC legislation would cause them to be. "Once you start nominating candidates yourself as a legislature, you're no longer regulating the process of elections, you are contributing to its substance," he said. ALEC Director of International and Federal Relations Karla Jones insists that the legislation is not a step toward getting rid of the 17th Amendment. "Actually, the people on my task force that support it see it more as a way to preserve the good parts of the 17th Amendment," Jones said. "Because the reason that the 17th Amendment came into being, there were states that weren't being represented with senators, because state legislatures weren't sending in their nominees. So it's a way to preserve that, while at the same time giving state legislatures a voice in the process, which the constitutional founders originally thought they should have." Now, however, all states are represented in the Senate, and citizens don't have to worry about delinquent state legislatures. "Correct," said Jones, when this point was noted. "But the state legislatures have been cut out of that process, unlike what the founders originally intended. So it's ... sort of a compromise measure, where you preserve the positive aspects of the 17th Amendment, while having the state legislatures have the role that the Constitution originally intended." Jones said ALEC has no position on the repeal of the 17th Amendment. If the smaller ALEC task force votes to endorse the legislation, then it will go to the ALEC board, which will decide whether to adopt the model policy and post it on its website. 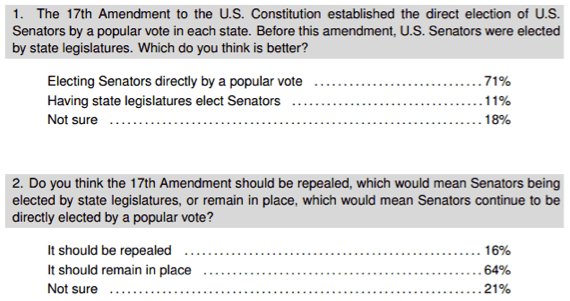 The 17th amendment is also popular with the vast majority of the American people. According to a HuffPost/YouGov poll taken Nov. 4-5, only 16 percent of the public believes it should be repealed, compared to 64 percent who are fine with it. One significant issue could be how state-endorsed candidates would appear on the ballot. Traditionally, candidates endorsed by the major parties have a Democrat or Republican notation after their name. "They might have something in some ways more powerful than a regular party label, which would be a candidate chosen by the legislation. ... You could imagine a candidate saying they've been endorsed by the state. That's very powerful. ... If they just appear as an independent, basically, it might be less effective," said Schleicher. The measure could also lead to shenanigans by state legislatures. For instance, a GOP-controlled legislature could nominate a Democrat to appear on the ballot, splitting Democratic votes between two candidates in order to help a Republican nominee's chances. Or a Republican legislature could make clear that it's standing behind a certain candidate, despite whoever voters might pick in a primary, thereby creating incentives for other candidates to drop out and perhaps tipping the scales toward an establishment pick. Brian Wietgrefe, research director for the group ProgressNow, first highlighted the bill. The organization helps promote progressive infrastructure in the states. "ALEC tries to pass itself off as a centrist business group, and promised to stop working on elections policies," said John Neurohr, spokesman for ProgressNow. "Now it turns out they lied, and are again looking to roll back the people's right to vote for senators through a fringe-radical piece of legislation. Every new element of transparency just proves ALEC is rotten to the core." CORRECTION: A previous version of this article misidentified Pete Hoekstra's opponent in his 2012 Senate race.